Gold may appear to be going down in the west, possibly due to suppression of the gold price through short selling, but gold is actually going up while currencies are going down, at least in the east and Central America if not in the west. 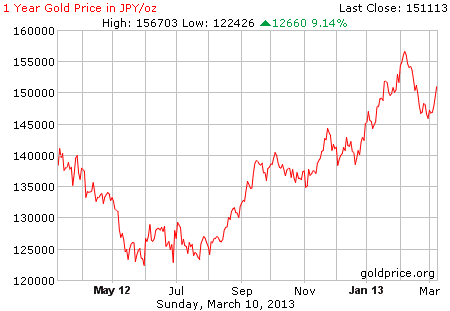 In Japan, for example, gold has gone up like a rocket 36 percent. An ounce of gold in Japan selling for 125,000 yen in July 2013, now sells for 145,000 and even peaked at a highest ever of 155,000 in February. Japans ‘quantitative easing’, or print money like toilet paper, has reduced the value of the yen plummeting on international exchanges. So if a Japanese citizen has a yen for gold it is going to take more yen than ever to buy gold. China is continuing its policy of acquisition of gold and mines. Recently it purchased another gold mine. China African Precious Metals (CAPM) has just bought assets of the embattled Aurora gold mine in South Africa. In a recent statement, CAPM said “it reached an agreement with provisional liquidators of mine and successfully met their requirements, including the full payment of the acquisition price.”. "The board of directors sees its investment in the mining sector in South Africa as its first imprint in Southern Africa,"
China is evidently not keen on continuing to hold assets in currencies that other countries can devalue with quantitative easing at will so are continuing to buying more gold than ever, using their quantitative US dollars. Gold bar sales in China, for example, doubled in the Spring Festival this year compared to last. Sales of gold and silver have increased almost 39 percent. Gold has also reached a highest ever in other countries such a Brazil, Iceland and India for example. And those Argentineans who exchanged their pesos for gold in 2007 are now very happy folk. In just the past two years, gold in Argentina went up 45 percent and also hit record highs. So how come gold is going down in the west and up in the east? Both area practice quantitative easing and the currency is worth less and less as a result. Checking the Japanese one year chart (above) for example, it is easy to see the difference between the western countries, USA, Europe etc as compared to major eastern such as India and Japan. Perhaps the fact that there is little short selling in India and Japan compared to the US and western countries is a pointer to the effects short selling can have on the price of a commodity. Of course no one is going to object while they can buy gold for so few dollars. 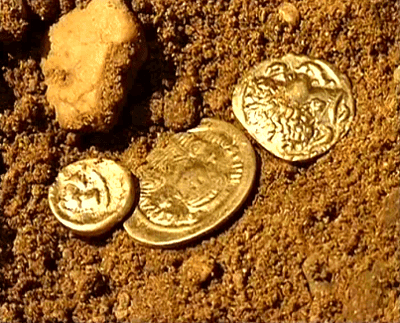 Or perhaps the big movement of gold from the west to the east is motivated by profit. 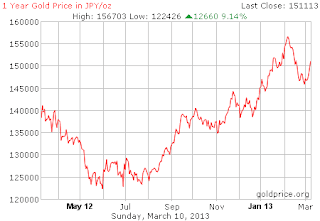 Buy gold in the US for a pittance and sell in Japan for a nice tidy profit. What ever the reason, one can say that the real price of gold is up while the value of currency is down.